To get High Scores in Subway Surfers like over 1,000,000 Score or even above 5 Million!, all you have to do is run, dash, jump, roll, dodge as fast as you can - and don't let the Inspector catch you! Avoid obstacles, use single use items and pick up upgrades along the way to help you survive runs. For more information, follow the guide steps below. Good Luck! 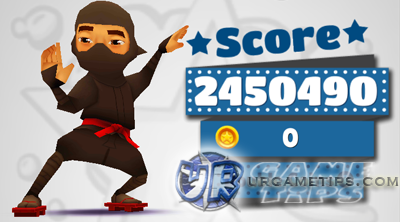 My best Score so far is 2 Million+ with my ninja character. I made it this far without hacks, cheats or any sort of coding tricks. I know that there are so many people out there who can go beyond my Score and yes, it's really possible. Let me show you how and maybe you'll surpass me too in no time! - If you have a Multiplier of x1 and you ran 100 meters, your Points = 100. 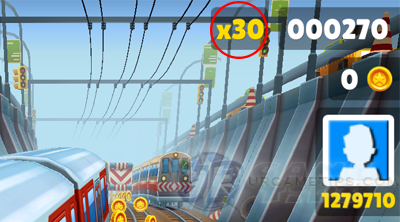 - If you have a Multiplier of x30 and you ran 100 meters, your Points = 3000! - It doesn't really increase your Score though but rather it reduces the length or time needed to reach a certain Score Points. Confusing? well the point is, you have to Max your Multiplier as soon as possible to x30 to get Higher Scores in no time! - Focus first on your Mission Sets to get the highest Multiplier. - After reaching Multiplier 30, go to the SHOP and buy some Score Boosters. Use at the start of you run to give +5 to your current Multiplier. This item will also increase your x2 Multiplier's maximum bonus point to 70! - Note: Update your game to Subway Surfers World Tour: Rio or later. - While you are busy completing your Mission Sets, upgrade your gears or upgradable items in the Shop to increase their duration. - I recommend Jetpack and 2x Multiplier to be maxed, since they can directly influence your Score while running. Upgrade and max out Coin Magnet and Super Sneakers the way you want. - Double Coins! (Optional): This is an optional feature for players that are willing to spend some real cash for this game. It can also help boost your Scores after every run because of the number of Coins gained. (I didn't use it though). 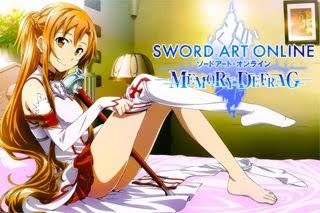 - There are some Boards or Characters (maybe in the future) that comes with a Special Power. Just like the board: Bouncer = Special Power: Super Jump. These are free but still very optional. (I didn't use any though). - The most important thing is to familiarize yourself with the game mechanics and improve your decision making, reaction time and more. Practice, run a lot and learn the patterns! - Look ahead to see what is coming in your way. This is really helpful specially when multiple or consecutive trains are coming. - Stay on top of trains to get a better view of what's coming! - [Jump] + [Left] or [Jump] + [Right] = Dash while in mid-air. Learn this to quickly dash around tight places, to quickly switch lanes to stay on top of trains, or dodge obstacles at the last second! - Master the [Jump] + [Roll] = Cancels Jump then instantly Roll. Highly Recommended to master the Super Sneakers, and it will greatly help you land on specific trains or prepare for an upcoming barrier or obstacle. - Collect Coins but if things gets tough, you may ignore them to focus more on dodging obstacles. Same way when collecting Powerups, also ignore other powerups placed on uncertain or dangerous areas. - Be aware of the duration or cool down of your items or Powerups! The Key Items: Hoverboards and Keys! - When you reach a good score, let's say around 50k, 100k, 150k or 200k, start using your Hoverboards! Hoverboards will greatly help you prolong your runs, giving you more opportunities to improve your Scores to over 1 MILLION! - Before setting a new High Score, buy some Hoverboards first in the Shop! - Many players buy around 10, 20, 50 or even over 100 Hoverboards because if you are now good enough, your Score will just depend now on the number of Hoverboards you currently have. 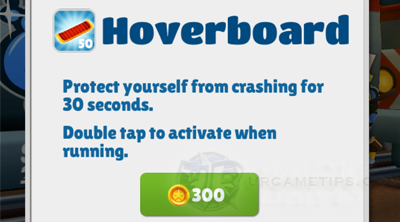 - Important Note: After using or crashing a Hoverboard, there is a 5 seconds delay before you can grab another one, so do your best not to get any crashes! Good Luck! - After crashing, quickly select the "Save Me" option to use a Key. This will give you a chance to continue the run again. - Keys can be found along the way or in Mystery Boxes. - First Save Me = 1 Key! - Second Save Me = 2 Keys! - Third Save Me = 4 Keys!